I wasn't sure about using two circular needles, so I did it the following way: I knitted first side with straight needles (three triangles), then I switched to one circular needle for the connecting band, then I knitted the first orange triangle using one straight needle and the circular (the other end of the circular just keeps the rest of the stitches), now I will begin the second triangle (yellow) and I'll knit this with two straight needles, and the last triangle will be knitted again with one straight and the other end of the circular. (I hope I made myself clear ^^). I also got holes and yellow lines on WS while connecting two triangles, but as I read girls' posts on Bag Me KAL it should felt nicely (I hope! I'm using quite a thick yarn). 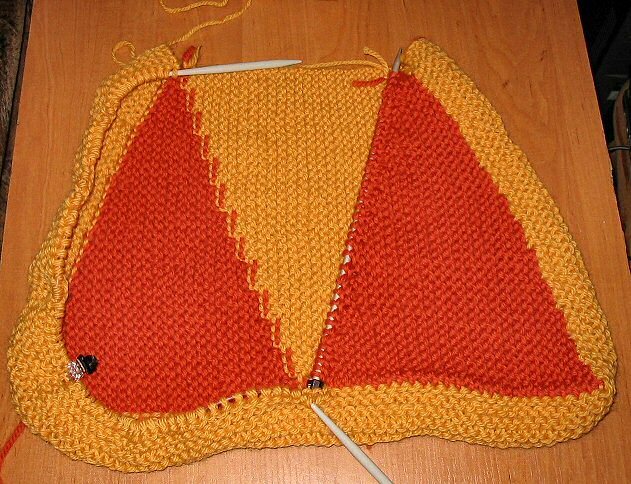 As far as picking up stitches for the connecting band, I helped myself with a crocheting hook, picking one stitch at a time with a contrasting yarn (colour B - yellow in my case) and placing it on the needle, removing the hook, picking up another stitch, an so on. As if I was crocheting the chain. My overall view on the pattern:After the initial confusion, ("cast on 39 st" - obvious, but then "R1: k3, turn" - what do you mean 'turn'?... what about the rest of the stitches?... ), I grasped the idea rather quickly and I really like this funny way of knitting.I can't wait to felt it! And I still haven't decided on handles, I'll give it some thourough thinking tomorrow. Don't worry there is no wrong way of doing things as long as you are doing... My aunt used to knit everything using only “Seed Rib Stitch”. She made a lot of sweaters for her family with rib stitch 1x1 and seed rib stitch. Now I’m the only and lonely knitter in the family. I agree. I knit strangely too but so long as it's always the same way it works out just fine. My mom can't pick up my knitting and knit on it or the difference with show. I can't seem to figure out what I am doing "wrong" but I just go with it! Hi, from a fellow bellydancer! My mom taught me to knit through the back too! I did that for awhile and then made myself knit through the front. But I didn't think to change my purls, so my stiches weren't right! :) I couldn't tell though. I like the bowling bag!